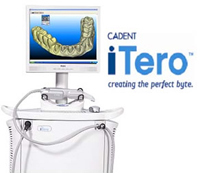 We keep up to date with the latest technology available for your dental treatment. We won’t add technology just for the sake of it, but only that which we think will aid in giving you the best care possible. 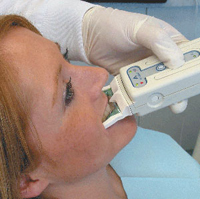 The T-scan is a computerized occlusal analysis (bite analysis). The sensor is placed in your mouth. All you have to do is bite down. The sensor instantly tells us where your pressure points are, which tooth hits first, etc… Armed with this information, we can come up with an accurate treatment plan. Few things are as important to the success of a dental restoration as accurate impressions of your teeth. 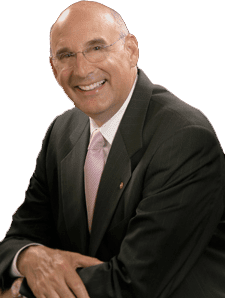 While many current methods are uncomfortable and imprecise, with this new scanning technology we can get a more accurate and much more comfortable impression. No longer will your teeth need to be coated. We simply scan your bite and upload the information to our lab. This detection aid helps us detect caries (tooth decay) much earlier, enabling you to have less invasive treatment. It works like a Doppler radar using fluorescence to detect caries in fissures and smooth surfaces that may go unnoticed in X-ray images. The decayed region of your teeth show up as red on the screen, while the healthy tooth structure show up as green. 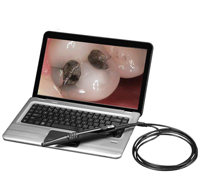 It can also detect decay hidden between the margins of any existing composite and amalgam fillings. With this small camera, we can reach all areas of your oral cavity without discomfort. This enhances our diagnostics and allows you to participate in your dental treatment. Just one look at the monitor will help you see the true condition of your tooth, including cracks, cavities, and broken fillings. The additional visual will aid in explaning your treatment options—arming you with the information you need to make an informed decision. *All images courtesy of Tekscan, iTero, and AirTechniques.